We thought we would be working all weekend, but it turned out Easter Sunday was a good day to rest. But starting Monday morning, we were back at it. 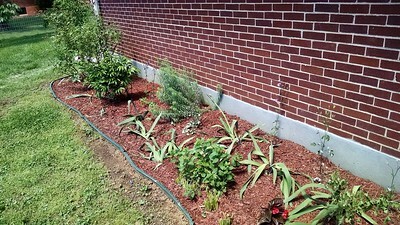 We concentrated on landscaping the first part of the week and got all the flower beds weeded, thinned out, and mulched. 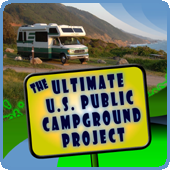 On Monday, our friends Steve & Esther checked into our RV park on their way to Calgary. Linda put them to work at the house on Tuesday. 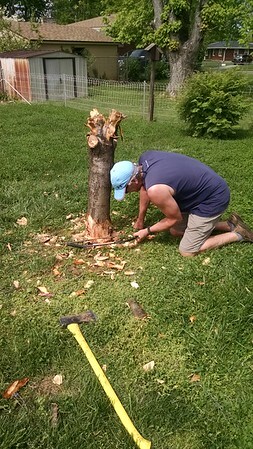 Steve and I worked on cutting down dead trees, pruning live trees, and cleaning up the big stuff in the yard. Unfortunately, we didn't have a chainsaw, so a bow saw and an ax had to do. 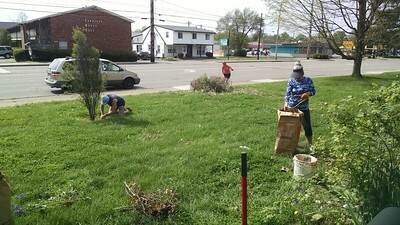 Linda, Sandy, and Esther worked on the flower beds. At the same time, we were working on getting a contractor for several projects, and the painters were scheduled to begin Monday night. We also decided to resurface the kitchen counter top, the kitchen back splash, and the old green wall tile in the main bathroom. The biggest issue was finding people that could start when we needed them to AND get everything done in a week and a half. Everybody in Louisville is trying to spruce up their houses for the Kentucky Derby, the first Saturday in May, so all the big companies are busy. Many said it would be a week to two weeks just to get an estimate. 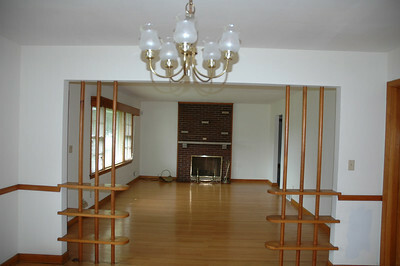 Trying to think of everything we needed to tell a buyer, I started thinking about the fireplaces. My parents never used the fireplaces (one on the main floor and one in the basement), so I had a fireplace expert come out to inspect the chimney and make sure the fireplaces worked. To our surprise, they said there has never been a fire in the main fireplace (and this house was built in the 1950s). A gas line is plumbed in, but the fireplace has never been used. The basement fireplace also has gas plumbed in and it works just fine, but it's only been used rarely. Both fireplaces would be fine for a wood fire. The chimney is in excellent condition. Good to know. On Tuesday, our contractor started. We had moved the laundry upstairs from the basement for my parents, and my Dad confiscated a closet of one bedroom to install a washer and dryer. He pretty much destroyed the closet, so we are having it re-built and the washer/dryer hook-ups put back downstairs so we can market the house as three bedroom, two bath. We're also adding a laundry sink in the basement while we're at it. We're putting new vanities in both bathrooms along with new light fixtures. We're going to put tile on the floor of the small bathroom and the kitchen, and we're going to rip up five rooms of carpet along with the padding and tack strip to expose the hard wood. And we're going to put quarter-round throughout. In addition to all of that, we've got to clean the full basement, the garage, and a shed. 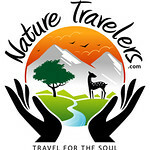 And we hope to have all of that done by Tuesday night of next week as we have a professional photographer coming Wednesday morning to get photos for the onslaught of online marketing. We expect to have the property listed by a week from Friday and our first open house by a week from Sunday. Hopefully, we'll sign a contract before we leave for Tennessee the next day. We knocked off early on Tuesday afternoon to have some fun. Linda had booked us for an "escape room" game at Breakout Louisville. It's an adventure game where your group searches for clues and performs tasks until you finally gain the code to get out of the room. You have one hour to "escape". The room isn't really locked, and you can leave at any time, but for the integrity of the game we considered it locked. Steve & Esther, and Linda & I met Dale & Sandy at the location after getting cleaned up from landscaping. After the game, we had reservations at one of Louisville's finest restaurants - Corbett's. The pre-meal game and dinner were our treat for all the hard work our friends volunteered to do for us. After starting with some delicious cocktails, we all decided to do the Chef's Tasting Menu - a five-course dinner that requires the whole table to agree for it to be served. We had such a fantastic meal and wonderful company. We asked if we could meet the chef. Our waiter said "I'll see if Chef Jay can come out". Then Linda said "Chef Jay? We wanted to see Chef Whim!". You see, my darling wife had scanned the menu and noticed in a couple of places "Chef's Whim". She apparently didn't look closely enough to understand it indicated the chef would make a special selection on a menu item or two. I had noticed the "Chef's Whim" reference, so I immediately knew what she was thinking - there has to be a Chef Whim back there somewhere. On Wednesday, we were back at it. I had a meeting with some real estate agents in the morning, and Linda and Sandy continued working the back yard flower beds. I mulched what they already had completed. 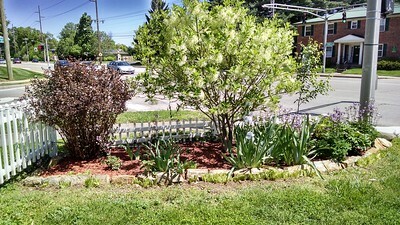 On Thursday, I finished mulching and then we finished up the yard with some final pruning. My Mom would be proud of how the flower beds look. They've been neglected for so long. On Friday, Linda & I took on the task of ripping up all the Berber carpet. It was eleven years old and while a lot of it was in decent shape, some of it, especially in my Dad's room, was just awful. But we knew there was some nice hardwood underneath. 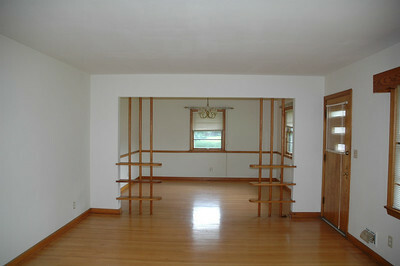 These are photos from when they moved in back in 2006. 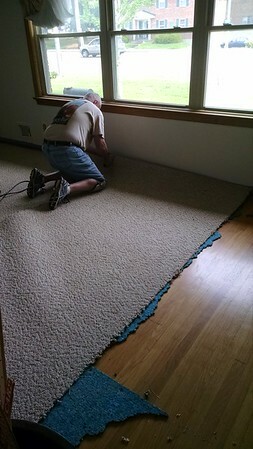 Our contractor, Jimmy, laid tile in the bathroom while I cut carpet and pulled up the padding in the other rooms, and Linda pried up the tack strip. Samantha showed up and took over my "carpet pad staple" duty. That helped us get through everything much faster. 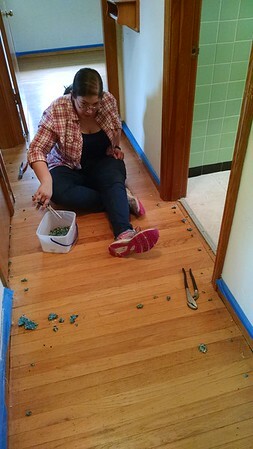 Next to Samantha, you can see the green tile in the bathroom we are having re-surfaced to a more neutral color. Before we left Friday night, all the carpet, pad, tack strip, and staples were up. We had a couple of bad spots in the wood floor but, for the most part, it still looks great. It's old school hardwood, but very little needs to be done to it. We're just going to put quarter-round down, try to do some quick fixes on the bad spots, and let it go. On Saturday, the painters arrived early to finish up the walls and ceilings. Jimmy also arrived early to finish up the tile in the bathroom and get started on the kitchen floor. He brought his little son, who was in the basement stacking up junk and sweeping to earn money for his school's book fair. And Nick, our re-surfacing specialist, also came to do some prep work. It was "Thunder Over Louisville" day, which is the massive fireworks display and military air show over the Ohio River downtown. It's the kick-off for the two-week Kentucky Derby Festival. Unfortunately, it was cloudy, rainy, and about 50 degrees most of the day. Not a pleasant day to rub shoulders with anywhere from a half million to a million people. Later in the day, Jimmy had some "scrappers" come by to haul away some of the metal scraps and wiring. My Dad had rigged a lot of wiring to make things work for him in his basement shop, his shed, and elsewhere. However, we learned a lot of it would be flagged by a home inspector, so we're trying to be proactive and remove as many potential issues as we possibly can. We finished up around 4:30 on Saturday, and headed over to Dale & Sandy's for dinner and games with them and their friends from Indianapolis who were in for the weekend. They allowed us to spend the night, so we wouldn't have to make the long drive back to our rig and then drive back to the house in the morning. It was another nice evening that allowed us to get our mind off of the house. Early Sunday morning, Nick, the resurfacing guy, showed up and did a little more prep work. He was gone before we got to the house. I had offered him a little financial incentive to get everything done by Tuesday, and he seems to be trying his best. Linda & I concentrated on the basement. We hauled up all the remaining junk, and did some more cleaning. Jimmy had Little League baseball duties to attend to, but he was supposed to arrive Sunday afternoon. When he didn't show up, we were a little worried. It turned out his wife, who is eight months pregnant, was in the hospital. Fortunately, it wasn't serious and she got back home. We rented a shop vac (having sold my Dad's at the estate sale), and Linda did a final cleaning of the basement and the shed. We had 1-800-Got-Junk come and haul away a couple of mattresses, old TVs, all the carpet, all the bags we had in the garage, and everything else outside we needed to get rid of. Tomorrow, we will clean the garage and take up the indoor/outdoor carpet in the breezeway between the house and garage. It's one of the first things people see when they come in, so we want to re-carpet it (cheap) and make it look nice. I've started a spreadsheet that keeps track of the money we've put into the house, and where our sales price needs to be assuming different sales scenarios. When it comes down to it, while I think we will cover the costs of our improvements, I don't think we'll increase the net amount we'll put in our pocket. 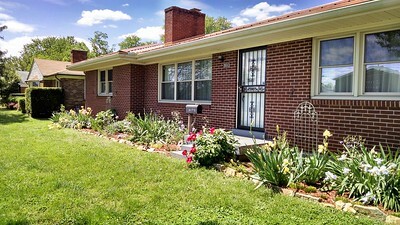 Still, it means something to us that the house is in good shape and move-in ready for the next owner. If we happen to get more than we're expecting in this competitive seller's market, that will just be a bonus. Whew! It always turns out to be so much more work. Those floors are beautiful, they should really be a big selling point. Good luck on the sale. That was such a fun work camp! Thank you again for the great dinner and fun evening 😁 I'll never forget the look on the waiter's face when Linda said "We want Chef Whim!"